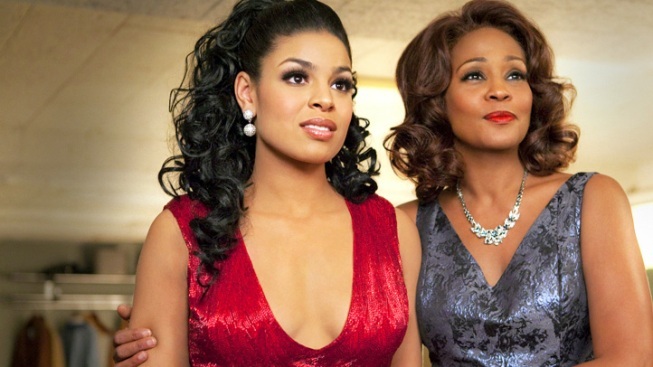 Jordin Sparks and Whitney Houston in "Sparkle." One of Whitney Houston's final songs, recorded days before her death, made its debut Monday. Ryan Seacrest featured the song — "Celebrate," a duet with Jordin Sparks — on his morning radio program, indicating that it was the last song the pop superstar recorded before her death at the age of 48. The upbeat track, produced by R. Kelly, was recorded for the movie "Sparkle," a remake of the '70s film about three sisters who form a Motown group in the 1960s. On the track, Sparks and Houston sing about things looking up, the sun chasing away all the rain, and forgetting all of life's problems for just one night. Houston takes the lead on one line with a more haunting meaning following her February death in a Beverly Hills hotel room: "Just trying to make it from day to day / Tonight don't you worry 'bout a thing / Just cash your cares away," she sings. Houston's drug habit, which pushed her to the edge in the 90s as she tried to cope with a tumultuous marriage, hadn't been kicked at the time of her death, her autopsy report showed. The movie was going be a major comeback for Houston who hadn't been on the big screen for 16 years. She finished filming just three months before her death and recorded the last part of the soundtrack on Feb. 7, days before her death. Harvey Mason Jr., one of the album's producers, told People magazine that she seemed in great spirits that day. "She got in the booth, started her vocal session with a prayer as she always did and worked for about three or four hours," he said. "We ended the session dancing around the control room while she sang 'Turn it up! Turn it up!' She was so fun-loving." Houston's rendition of the gospel standard "Eyes on the Sparrow" will also be featured on the album.